For a long time I have called myself a foodie, taking an interest in all manner of things food. When I think about how I became so interested in food, especially in regards to gastronomy, food history, and trivia, I think it was out of personal interest, yes, but also that I was always looking for ideas for the food I was making for my brother and thinking of ways to incorporate these different things and making them adaptable to SCD. Some of these things, like dorayaki, I have never eaten the traditional version of. As my “foodie-ism” (as my sister likes to call my culinary interests) evolved, especially once I started food blogging, I started to read more books about food. A number of the authors I read came from reading Dianne Jacob’s Will Write for Food, the first edition. My favourite is Ruth Reichl and it was from reading her books that I became more interested in food writing and also realizing the fine craft, like any genre, that writing about food is. There were several recipes that I bookmarked or was inspired by, though sometimes a recipe was simply inspired by her description of a particular food or meal. Her succulent and descriptive writing style doesn’t suffer from the 140-character limit of Twitter either; crafting succinct, almost minimalist in style, tweets that are like reading bite-sized pieces of poetry that encapsulate and convey their meaning beautifully. It was a recipe that Ruth Reichl posted on her blog that inspired me to make these blueberry muffins. 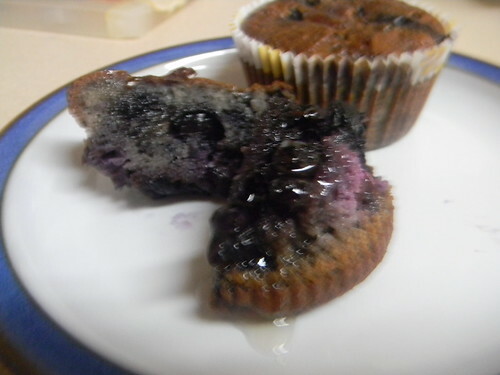 A bit more research and I found out that the blueberry muffins recipe she shared was from the first Gourmet Cookbook, which she edited (she edited the second one as well). I’ve never read it, save an Amazon preview, though I know it’s a tome of a cookbook with more than one thousand recipes; quite a hefty thing to carry around. 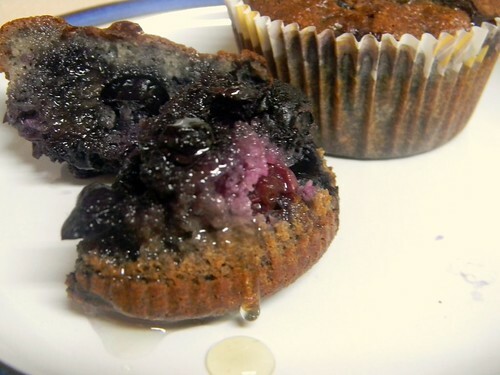 My recipe is different from the Gourmet recipe, though the muffins are just as studded, or stuffed, with blueberries. They’re also surprisingly moist, given that they’re made with almond flour: the softness and moistness is more in tune with baked goods made with nut butter. It is a mildly sweet muffin, making it perfect for breakfast (I felt briefly inclined to call them breakfast muffins) or a morning snack, and spread with some coconut oil in solid form (if you’re not dairy-free, butter is also good) or drizzled with a little honey. As it’s back to school season, I’m thinking more of and making food, including treats and snacks, that are more portable and suitable for packing. If you have any lunch kit ideas or suggestions for what you’d like to see here, leave them in the comments below where I can read them and take them into consideration. Thank you! Tweet! WordPress has introduced a brand, spanking-new tweet button so now if you like a post you’re reading, like this one, and want to share it with your friends, followers, or tweeps, you can now do so with just a click of that button at the bottom of the post. When you click it, a popup will appear with a shortened URL and you can then tweet it, or add your own comment first. Like it? On a similar social note, you can also now like a post, such as this one, using another new button WordPress has integrated. I’m not sure if this “like” button is for just WordPress bloggers or if other bloggers using different blogging platforms can use it as well (I’ve only blogged with WordPress), but go ahead and like this post anyway. This button only appears to logged in WordPress users, unfortunately. Or, as always, comment! Simmer half the blueberries with the water in a small pot, until the blueberries have released their juices and it’s slightly thickened. Remove from heat and pour into a mixing bowl. Mix in the honey, coconut milk, extracts, and eggs. Add the almond flour, baking soda, cinnamon, and salt, mixing well. Gently mix in the remaining blueberries. The batter will be blue or teal in colour. Pour the batter into the prepared muffin cups, filling each cup almost to the top. Bake for 30 to 40 minutes, or until the top springs back when touched. Remove from oven and cool. Enjoy! Looks delicious, I can’t wait to make them!!! Wow, those are the blu-est blueberry muffins I have ever seen! They sound fabulous. I have to experiment more with baking with other nuts since the husband can’t have almonds. Zoe, these look awesome. You are so right. These are a perfect start to a school morning! As soon as my Almond Flour order shows up from Digestive wellness, I am so going to make these. One of these muffin, a hard-boiled egg, and a slice of bacon would be a perfect start for my kiddos. Alisa – I’m sure these would still work if you tried making them with another nut flour other than almond. SCD baking in general is pretty flexible when it comes to nut flours, just keep in mind the oil content of the nut you’ll be using. Kim – I’m still quite keen on calling these breakfast muffins, so much so as to update the recipe index to include a breakfast category but, egads, sometimes categorizing food in terms of meals or snacks can be pretty hard and essentially comes down to personal preferences, doesn’t it? Shirley – You completely made my day! 🙂 Thank you! Your blueberry muffins look like real yummie treats! They look quite fab too! Hey there, I cannot have coconut milk or any other milk either, is there any way to make these delicious looking muffins without using that? Hi Jennifer, can you have applesauce? If you can, try replacing the thick coconut milk with an equal amount of applesauce. Good luck! thank you!! they came out a little runny but extremely delicious!! !